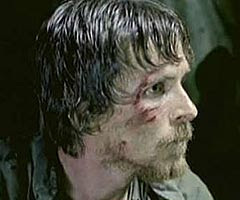 Check the Fien Print: MoviesWatch: "Rescue Dawn"
Follow through after the bump for my thoughts on "Rescue Dawn." Werner Herzog almost never makes movies that aren't Werner Herzog Films and "Rescue Dawn" is such a Werner Herzog Film that he's had to tell the same story twice in less than a decade. I caught 1997's documentary "Little Dieter Needs to Fly" via Netflix and enjoyed its Herzogian tale of one man's single-minded determination to first fly and then to remain alive in the face of great inhumanity and all manner of natural obstacles. The decision to make "Little Dieter" into a narrative film didn't seem necessary, but the casting of Christian Bale was too perfect to resist. In Bale, Herzog may have finally found a perfect replacement for the late Klaus Kinski, an actor willing to absolutely cripple himself to commit to a role, only without Kinski's trademark instabilities. Of course, Kinski's instabilities played off Herzog's own instabilities and certainly yielded moments of genius. Perhaps it's that lack of creative friction that keeps "Rescue Dawn" from reaching the heights of a "Fitzcarraldo" or "Aguirre, Wrath of God." Or maybe Herzog was respectful of the fact that he was making a true studio film here and kept himself emotionally in check. Or maybe, and this is my personal favorite theory, the reliable 20 point/10 rebound stability of first-time producer and power forward Elton Brand kept things under control. Bale gives exactly the kind of "My cheek bones will terrify you, but my eyes will still burn with life" performance that you'd expect. He remains a criminally neglected actor by the various award-giving bodies and I fear that he's going to keep doing projects like this and "The Machinists," films were the lines between acting and actual malnutrition becomes unrecognizable. I think that if the Academy would just throw an Oscar nomination he way, he might be inclined to eat again. "Rescue Dawn" is a straight-forward POW film shot without excessive Hollywood plot points and traditional dramatic beats almost until the very end. It's about survival, but not in a way that requires any sort of story arc, which is a huge relief. Thanks to Herzog's dedication to the film's environment, the tension is organic (pun sort of intended) rather than contrived. The stagnant streams, overgrown jungle and harsh cliffs are more carefully and humanely depicted than any of the Laotian or Vietnamese soldiers, to be sure. Herzog doesn't build the movie to key places like Capture, Escape, etc, because survival is just more complicated than that, so the viewer is never lulled into believing that the next obstacle Bale's Dieter faces will be his last. This hell could go on forever. That's not what viewers are necessarily looking for in the summer movie season, so "Rescue Dawn" is a tough sell. In addition to Bale, the film features several other strong performances, though the supporting work is mostly one-note. Steve Zahn's emaciated Duane showcases the most dramatic work yet from the comedic character actor, but this isn't necessarily the kind of thing you'd want to encourage him to keep doing. On the other hand, I would gladly suggest that Jeremy Davies keep doing his Charlie Manson impression over and over and over again for as long as people will pay him. That sucker is pure gold. Oh and in a piece of casting that will amuse me and maybe 5 other people, I loved seeing Toby Huss as Spook, one of Dieter's fellow pilots. You see, they were bombing Laos and Huss is perhaps best known as the voice of Kahn on "King of the Hill," surely TV's most familiar Laotian. "Rescue Dawn" has been on the shelf for a long time, largely because MGM never had a clue how to make anybody see it. A slow roll-out as alternative programming in the summer isn't a bad choice, though I wonder if the failure to give the film a November/December berth will cost it Oscar attention and a place on critics' Top 10 lists. That might be a shame.